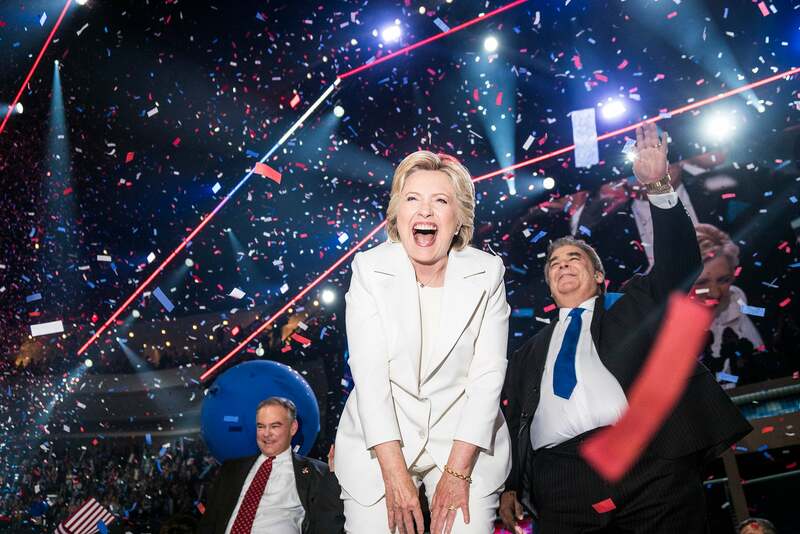 Ben Lowy’s photograph of Hillary Clinton at the 2016 Democratic National Convention has just been named one of the top 100 photos of the year by Time Magazine. When he made the picture, Lowy was with a select group of vetted photographers who had close access to the stage. As his fellow photographers crushed around one another to get the best angle, Lowy took advantage of his physical size and his Sony α7R II’s LCD to get a clear vantage point and, ultimately, the award-winning image. Lowy describes how it all happened. “I was in “the buffer”. It’s a special area that’s protected by the Secret Service. I was one of eight or nine photographers who were allowed into that special area. We were all vetted beforehand. It's a small pool-access area only where the big wire services, The New York Times, Time Magazine, The New Yorker, and other big publications like that get access. “The buffer is in front of the podium and the stage. We were on our knees the whole time. I actually wore knee pads because you have to stay on your knees for about three hours. When you’re photographing from there, you're not allowed to use a strobe, especially when the candidates or any political leaders are speaking. But as the confetti and the balloons were falling, I figured that was a good opportunity to break out a strobe. I didn't think the Secret Service was going to get too ticked off if I did it then.